The small and cosy shop which was set up 5 years back, in 2012 gives the classy old-style halwai ki dukan feels, located in Shalimar Bagh. The shop is tucked behind trees on a busy main road. 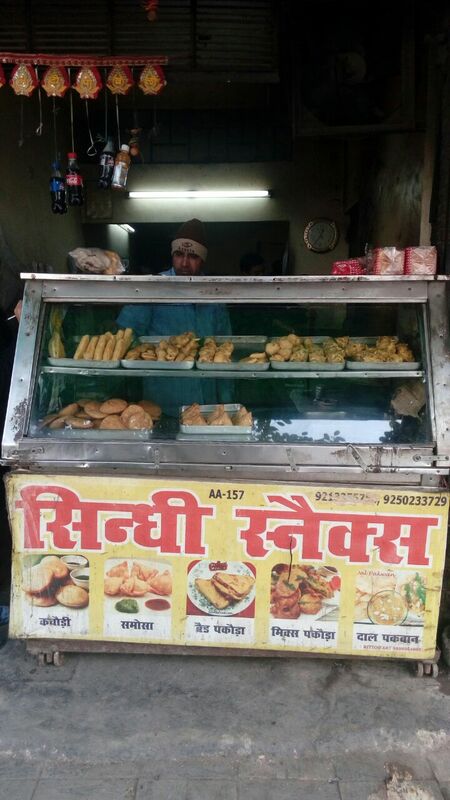 It is owned by Manoj Bhardwaj, who starts the shop at 9am and sits till the fried goodness is sold out. He started the shop as his family had been doing this for generations. Even though it has not been long, his snacks are a favourite amongst the locals. People come from far and carry parcels with dozens of kachoris. He fries the kachoris all day long in a kadhai which is a whopping 2 feet in diameter. The kachoris are fresh when served to the customers. The kachoris are filled with moong dal and are spiced lightly to compliment the hing-aloo subji which is laden with pudina chutney perfectly. The potatoes are mashed by hand, loaded with hing in a delightfully spiced curry. It is a match made in heaven. The size of the kachori is perfect and enough to satiate a person’s hunger. He also doesn’t shy away from giving refills of the curry and in a generous amount. His dal pakwaan are also very popular and are sold out like hot cakes. Pakwaan is a Sindhi snack, popularly eaten as breakfast made of plain flour dough, fried like a puri till it is appropriately crispy. The pakwaans are prepared by his sister-in-law on Sundays. It is served with Boiled Channa Dal with some basic spices, pudina chutney and raw onion on the side to create a sumptuous dish for brekkie. Bread pakora, mix veg pakora etc are cooked by one chef since the shop has been established. Other than him, there are 2 more helpers and sometimes the family members also visit to help out with the overwhelming inflow of customers.